Necklace Progenitor. 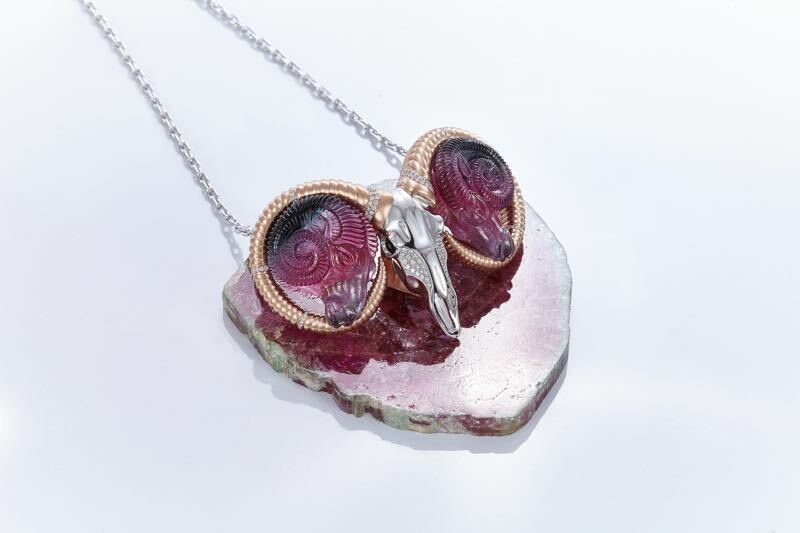 Two ram heads in pink tourmaline hand-carved by a German master sculptor from Idar-Oberstein mounted in 18 Karat rose gold horns set with diamonds and forming part of a white gold ram skull that is partly set with diamonds. A hand-made 18 Karat white gold chain completes the necklace, which is positioned on a multi-coloured tourmaline base that presents the necklace as a stunning show piece. The Ram as sculpted in Progenitor is a totem that symbolises the reigns of personal power. In ancient societies it stood for leadership, initiative and determination. The ram is also a the sign associated with Aries in astrology, and represents the astral symbol of rulership.